On Saturday night, 24 minutes into the World Cup match against Ghana, Australia’s soccer public was sent into a spiral of confusion, anger, doubt and foul language, with the sending off of marquee player Harry Kewell. Kewell’s red card was for a handball on the goal-line. 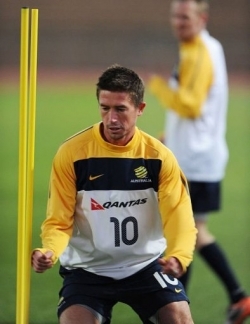 The ball hit Kewell’s shoulder before ricocheting down into his forearm. Ghana’s team was awarded a penalty, which they scored. Australia played out the game with only ten men. The rule states that a goal line handball has to be deliberate to warrant a red card. The handball was accidental and the judgment unfair. The consequence is that Kewell was rubbed out for the remaining 66 minutes of the match, and banned from the subsequent match. At the World Cup, where a team is lucky to play three matches every four years, this is a major penalty. 1. The referee should not be able to award red and yellow cards. Instead they should signal a ‘cardable incident.’ A panel will immediately view video replays and vote. The majority ruling will apply. Not only will it produce better judgments because a range of angles will be views, but it will also prevent the pressuring of the referee on cardable offences. 2. The punishments can then be made smaller. Penalties for rough play have been increased in order to discourage rough play. But the penalties continue to be handed out. Instead, video evidence should be used as much as possible. Players will respond to incentives. A higher chance of being caught will inhibit unfair play, as much or moreso than a higher penalty. I implore FIFA to apply these rules at once or risk a Thomas the Think Engine soccer boycott. Spain don’t cheat like Italy. This is probably why they have been listed as favorites at World Cup competitions but seem to under-perform. I used to think that USA, Australia, and New Zealand were being robbed conspiratorially by the referees, but now I think that the soccer teams of their countries just play fairly. Italy is like the Australian cricket team. Winning at all costs with the rules available can cross a moral line that ruins the enjoyment of the sport by having gamesmanship dry-hump sportsmanship. Should the laws of the game and the lawmakers of the game be responsible for cleaning it up? I think a country’s own government should comment on the way that their sporting teams behave un-sportingly in order to restore a balance. I think sin-binning is the way to go. Then there’s much more lee way with what the ref can use to discipline unruly players and behaviour. You could sin bin players for 5, 10, 15, 20 min blocks (subs not allowed) for varying degrees of yellow card offences (20 min for diving) then 20+ min for any red card offences. Then perhaps have it backed up by a match review panel for further disciplinary action if necessary. Previous Previous post: First Anniversary!